California Gov. Jerry Brown has signed a bill that will legalize assisted suicide for terminally ill patients. The End of Life Option Act will allow doctors to prescribe life-ending drugs to the terminally ill. In order to receive a lethal prescription, patients will have to submit two oral requests and one written request. The oral requests must come at least 15 days apart. The written one must be signed in front of two witnesses who state the patient is of sound mind and not under duress. Opponents of the bill argued the legislation might result in people with disabilities being coerced into ending their lives prematurely. The Catholic Church was a leading opponent of the bill. Brown is a former Jesuit seminary student who once considered becoming a Catholic priest. The governor said in a signing statement he considered theological and religious arguments that any deliberate shortening of one’s life is sinful. Assisted suicide bills previously failed in the Legislature in 2005 and 2007. In 1992, California voters rejected an initiative that would have allowed physicians to administer lethal injections. The bill Brown signed is modelled after an Oregon law that was adopted in 1997. California is the fifth state to legalize assisted suicide. In addition to Oregon, assisted suicide is also legal in Washington, Vermont and Montana. It follows that with terminating the life of the unborn, sanctioning administrative suicide of the dying is consistent with the trend — that in the future will probably consider those who are mentally disturbed — given they too may be able to rationalize the “right of choice”. All of this is being taken from the control of ministers and priests and given to lawyers. Is genocide of those less favorable not far behind? Be careful Republicans in California — your time may be limited. With Government now in charge of health care, how long will it take before the insurance companies are suggesting suicide as an option to cut costs? Your source has done you a disservice. The promoters of assisted suicide have worn out their thesaurus attempting to imply that it is legal in Montana. 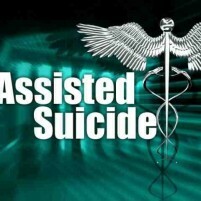 Assisted suicide is a homicide in Montana. Our MT Supreme Court ruled that if a doctor is charged with a homicide they might have a potential defense based on consent. The Court did not address civil liabilities. No one in Montana has immunity from civil or criminal prosecution. Does that sound legal to you? Oregon model bills have been rejected by our legislature in 2011, 2013 and 2015 because of gaping loopholes that allow exploitation of elders and people with disabilities of all ages. Passage would have established dangerous public policy. By Oregon and Washington law all family members are not required to be contacted. A single heir is allowed to initiate and execute the lethal process without a witness, thus eviscerating intended safe guards. Everyone involved in the lethal process gets immediate immunity. A witness is not required to confirm the dose was self-administered so if they struggled and changed their mind who would ever know? In addition these laws prohibit investigations or public inquiries leaving no recourse for surviving family members who were not contacted. Does that sound like good public policy to you? This is a very dangerous public policy that allows for the exploitation of elders and people with disabilities of all ages. However, it serves the health insurance corporations very well. Unfortunately all of these loopholes are embodied in California’s ABX2-15. Oregon and Washington should amend their initiative-sound-bite driven dangerous laws. Also note how the promoters of assisted suicide cling to their verbally engineered polls that claim a majority is in favor. I polled thousands of Montanans one-on-one as I served 60 days at fair booths across the state. Once folks knew about the loopholes in all of the Oregon model bills, 95% were not for them. So much for their verbally engineered polls. There were a few people (about 2%) that believed in the survival of the fittest who remained in favor of legalizing assisted suicide even after learning how these bills are written and can be administered to expand the scope of abuse. Their reasoning was that if one cannot control their family then their life should be cut short. 98% do not agree with that. Do you?